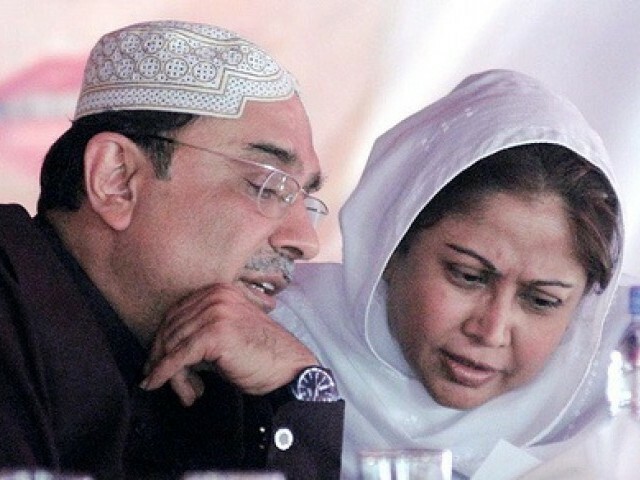 KARACHI: Former president and Pakistan People’s Party (PPP) Co-Chairman Asif Ali Zardari and his sister Faryal Talpur did not appear before the Federal Investigation Agency (FIA) on Wednesday for submitting their responses in the Rs35 billion money laundering case, citing their ‘hectic’ election canvassing, as Zardari denied involvement in the case. The siblings are expected to appear before the Supreme Court (SC) on Thursday in the same case along with 20 other suspects, including prominent businessmen and bankers, in the case that is being said to be the biggest money laundering scam in Sindh till date. A day after the SC’s order for placement of the names of all those connected to the case on the ECL, the FIA constituted a joint investigation team, headed by FIA Sindh Director Munir Ahmed Shaikh, to investigate the matter. The FIA had directed the duo to appear before the team on Wednesday to record their statements and explain their position on the accounts and transactions. However, two junior lawyers appeared before FIA authorities on behalf of Zardari and Talpur and sought more time to provide information about the transactions, saying that since they were busy campaigning for the upcoming polls, the siblings would only be available to respond to queries after July 25. Speaking to a TV channel late on Tuesday night, Zardari denied involvement in the scam. The former president said that he will face the ‘bogus cases’ like he did in the past, adding that he was sent notice of Rs150 million rather than propagated Rs35 billion. “It’s difficult to stop whatever is happening through democratic means,” he said, adding that his party would not boycott the forthcoming polls. “We won’t give anyone opportunity by boycotting the election,” he added. He said that it’s the time of election, not accountability. “The accountability should be conducted before or after polls,” the former president said. Meanwhile, the Interior Ministry has confirmed that the names of Zardari and Faryal have been placed on the Exit Control List (ECL) on the SC’s orders. The SC had ordered the Interior Ministry to place the names of all suspected beneficiaries ─ including Zardari and Talpur ─ and accused persons identified in the case on the ECL, “so that they may not leave the country until the investigation in the matter is concluded or till further orders passed by this court”. Caretaker Interior Minister Azam Khan confirmed that the SC had directed the ministry to place Zardari and Talpur’s names on the ECL on Monday, and that the ministry had complied with the orders. Since 2015, the FIA has been probing suspicious transactions made through 29 ‘benami’ accounts — 16 of which were held in Summit Bank, eight in Sindh Bank and five in UBL. Zardari’s close friend and former chairman of the Pakistan Stock Exchange (PSE), Hussain Lawai, along with Summit Bank’s corporate unit head Taha Raza, have been taken into FIA custody in connection with the case. FIA officials maintain that 32 people, including Lawai, are being investigated for laundering billions of rupees through fictitious bank accounts. Seven individuals were said to be involved in suspicious transactions of around Rs35 billion. The accounts were allegedly used to channel funds received through kickbacks. On Wednesday, FIA officials transferred Lawai to Islamabad for further investigation in the money-laundering probe. The suspected beneficiaries the apex court has summoned on Wednesday include Nasser Abdulla Lootah, Ansari Sugar Mills Pvt Ltd (Anwar Majeed, Ali Kamal Majeed), Omni Polymer Packages Pvt Ltd, Pak Ethnol Pvt Ltd, Chamber Sugar Mills Pvt Ltd, M/s Agro Farms Thatta Pvt Ltd; Zardari Group Pvt Ltd (Asif Ali Zardari, Faryal Talpur), Parthenon Pvt Ltd (Iqbal Khan Noori), A-One International (account identified in Suspicious Transac­tion Report), Lucky Interna­tional (STR), Logistic Trading (STR), Royal International (STR) and Umair Associates (STR). Likewise, those who reportedly deposited the money in the accounts were: Bahria Town Karachi (Zain Malik), Sujawal Agro Farms Pvt Ltd, Tando Allahyar Sugar Mills Pvt Ltd, Omni Pvt Ltd, Agro Farms Thatta Pvt Ltd, Alfa Zulu Co Pvt Ltd, Haji Mureed Akbar (banker on behalf of contractor), Sher Mohammad Mugheri & Co (contractor), M/s Sardar Mohammad Ashraf D. Baloch Pvt Ltd (contractor), A-One Interna­tional (STR), Lucky Inter­national (STR), Logistic Trading (I.I. Chundrigar) (STR), Iqbal Metals (STR), Royal International (STR) and Umair Associates (STR). As per FIA Director General (DG) Bashir Memon’s report, the persons/companies in whose names fake/fictitious accounts were opened are: Tariq Sultan (A-One International), Erum Aqeel (Ibrahim Linkers), Mohammad Ashraf (Logistic Trading), Mohammad Iqbal Araen (Iqbal Metals), Mohammad Umair (Umair Associates), Adnan Javed (Lucky International) and Qasim Ali (Royal International). They have also been summoned for July 12. Besides, the apex court had ordered the production of the presidents/CEOs of UBL, Summit Bank and Sindh Bank (including those in FIA’s custody) on Thursday. The SC had also requisitioned several cases from the Sindh High Court (SHC) in this regard. The court had directed the State Bank of Pakistan (SBP) to seize/ freeze the account in which Summit Bank had deposited Rs7 billion as equity and that the latter should not be allowed to withdraw the amount.